Actions are things which can be done to pages (edit, delete, rollback, etc). They are distinct from Special Pages because an action must apply to exactly one page. To add an action in an extension, create a subclass of Action, and add the key to $wgActions. Actions generally fall into two groups: the show-a-form-then-do-something-with-the-input format (protect, delete, move, etc), and the just-do-something format (watch, rollback, patrol, etc). The FormAction and FormlessAction classes represent these two groups. Definition at line 39 of file Action.php. Definition at line 268 of file Action.php. References $context, $page, getName(), null, page, and wfWarn(). Link target can be overridden by a local message containing a wikilink: the message key is: lowercase action name + '-helppage'. string $to Target MediaWiki.org page title or encoded URL. bool $overrideBaseUrl Whether $url is a full URL, to avoid MW.o. Definition at line 394 of file Action.php. References getContext(), getOutput(), Skin\makeUrl(), show(), and wfMessage(). Referenced by HistoryAction\onView(), and DeleteAction\show(). Checks if the given user (identified by an object) can perform this action. Definition at line 307 of file Action.php. References User\getBlock(), getName(), getRestriction(), getTitle(), User\isBlockedFrom(), null, requiresUnblock(), requiresWrite(), and wfReadOnly(). Referenced by FormlessAction\show(), PurgeAction\show(), and FormAction\show(). Indicates whether this action may perform database writes. Definition at line 432 of file Action.php. Check if a given action is recognised, even if it's disabled. Definition at line 170 of file Action.php. 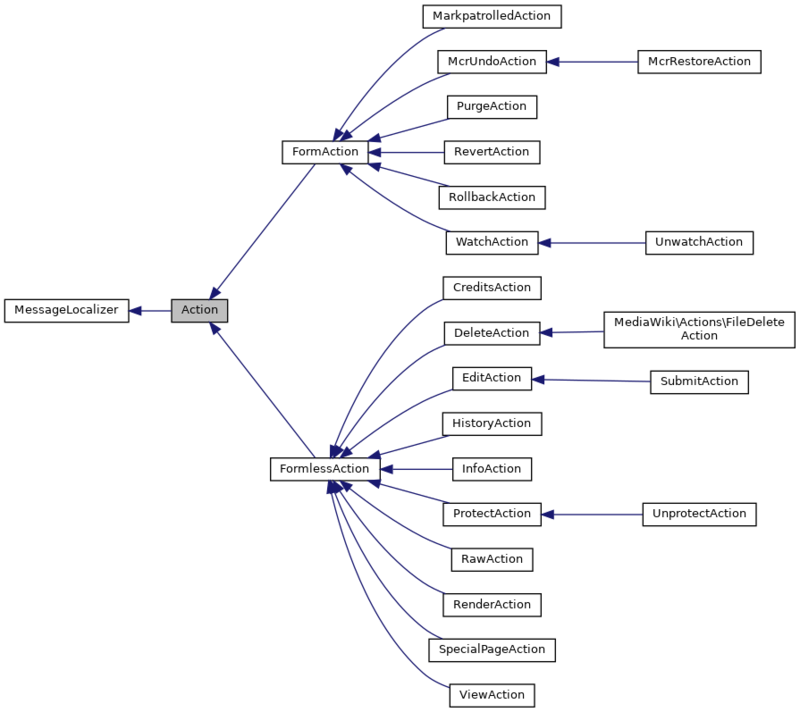 Referenced by MediaWiki\Permissions\PermissionManager\checkUserBlock(), HistoryAction\fetchRevisions(), ActionTest\testActionExists(), ActionTest\testActionExists_doesNotRequireInstantiation(), ActionTest\testDisabledAction_exists(), and ActionTest\testNull_doesNotExist(). Get an appropriate Action subclass for the given action. Definition at line 97 of file Action.php. Referenced by MediaWiki\Permissions\PermissionManager\checkUserBlock(), RebuildFileCache\execute(), MediaWiki\performAction(), SkinTemplate\prepareQuickTemplate(), ActionTest\testActionFactory(), ActionTest\testCanExecute(), ActionTest\testCanExecuteNoRight(), ActionTest\testCanExecuteRequiresUnblock(), ActionTest\testDisabledAction_factoryReturnsFalse(), and ActionTest\testNull_canNotBeInstantiated(). Get the action that will be executed, not necessarily the one passed passed through the "action" request parameter. Actions disabled in $wgActions will be replaced by "nosuchaction". Definition at line 123 of file Action.php. References $context, $request, $wgActions, IContextSource\canUseWikiPage(), IContextSource\getRequest(), and IContextSource\getWikiPage(). Referenced by SkinTemplate\buildContentNavigationUrls(), MediaWiki\getAction(), OutputPage\getHeadLinksArray(), OutputPage\getJSVars(), OutputPage\headElement(), ActionTest\testDisabledAction_isNotResolved(), ActionTest\testGetActionName(), ActionTest\testGetActionName_editredlinkWorkaround(), ActionTest\testGetActionName_historysubmitWorkaround(), ActionTest\testGetActionName_revisiondeleteWorkaround(), ActionTest\testGetActionName_whenCanNotUseWikiPage_defaultsToView(), ActionTest\testNull_defaultsToView(), and SkinTemplate\wrapHTML(). Get the Action subclass which should be used to handle this action, false if the action is disabled, or null if it's not recognised. Definition at line 69 of file Action.php. Definition at line 179 of file Action.php. References $context, RequestContext\getMain(), page, wfDebug(), and wfWarn(). Referenced by HistoryPager\__construct(), addHelpLink(), HistoryAction\getDescription(), FormAction\getForm(), getLanguage(), getOutput(), RawAction\getRawText(), getRequest(), getSkin(), getUser(), RollbackAction\handleRollbackRequest(), msg(), InfoAction\onView(), HistoryAction\onView(), InfoAction\pageInfo(), EditAction\show(), ProtectAction\show(), McrUndoAction\show(), and SpecialPageAction\show(). Returns the description that goes below the \<h1\> tag. Definition at line 382 of file Action.php. Definition at line 237 of file Action.php. Referenced by CreditsAction\getAuthor(), CachedAction\getCacheKey(), CreditsAction\getContributors(), InfoAction\getContributors(), HistoryAction\getDescription(), RevertAction\getFormFields(), RevertAction\onSuccess(), and InfoAction\pageInfo(). Return the name of the action this object responds to. Referenced by __construct(), checkCanExecute(), CachedAction\getCacheKey(), getDescription(), and FormAction\getForm(). Definition at line 208 of file Action.php. Referenced by CachedAction\addCachedHTML(), addHelpLink(), RollbackAction\handleRollbackRequest(), CachedAction\onCacheInitialized(), MarkpatrolledAction\onSubmit(), UnwatchAction\onSuccess(), WatchAction\onSuccess(), PurgeAction\onSuccess(), RevertAction\onSuccess(), McrUndoAction\onSuccess(), RawAction\onView(), HistoryAction\onView(), setHeaders(), FormlessAction\show(), ProtectAction\show(), EditAction\show(), ViewAction\show(), McrUndoAction\show(), and McrUndoAction\showPreview(). Returns the name that goes in the \<h1\> page title. Definition at line 372 of file Action.php. Definition at line 198 of file Action.php. Referenced by RollbackAction\alterForm(), RevertAction\alterForm(), MarkpatrolledAction\alterForm(), RevertAction\checkCanExecute(), RollbackAction\enableTransactionalTimelimit(), HistoryAction\feed(), McrUndoAction\generateDiffOrPreview(), RawAction\getContentType(), FormAction\getForm(), RevertAction\getFormFields(), McrUndoAction\getFormFields(), SpecialPageAction\getName(), RawAction\getOldId(), RawAction\getRawText(), MarkpatrolledAction\getRecentChange(), RollbackAction\handleRollbackRequest(), McrRestoreAction\initFromParameters(), McrUndoAction\initFromParameters(), RevertAction\onSubmit(), McrUndoAction\onSubmit(), RevertAction\onSuccess(), RawAction\onView(), HistoryAction\onView(), McrUndoAction\show(), PurgeAction\show(), RollbackAction\show(), CachedAction\startCache(), and useTransactionalTimeLimit(). Get the permission required to perform this action. Definition at line 294 of file Action.php. Definition at line 228 of file Action.php. Definition at line 247 of file Action.php. Referenced by RevertAction\alterForm(), McrUndoAction\alterForm(), RevertAction\checkCanExecute(), checkCanExecute(), HistoryAction\feed(), HistoryAction\feedEmpty(), HistoryAction\feedItem(), HistoryAction\fetchRevisions(), HistoryAction\getDescription(), RevertAction\getDescription(), FormAction\getForm(), RevertAction\getFormFields(), McrUndoAction\getFormFields(), RawAction\getOldId(), HistoryAction\getPageTitle(), RevertAction\getPageTitle(), getPageTitle(), InfoAction\getPageTitle(), RawAction\getRawText(), RollbackAction\handleRollbackRequest(), UnwatchAction\onSubmit(), WatchAction\onSubmit(), RevertAction\onSubmit(), McrUndoAction\onSubmit(), UnwatchAction\onSuccess(), WatchAction\onSuccess(), PurgeAction\onSuccess(), RevertAction\onSuccess(), McrUndoAction\onSuccess(), RawAction\onView(), HistoryAction\onView(), CreditsAction\othersLink(), InfoAction\pageInfo(), EditAction\show(), McrUndoAction\show(), and McrUndoAction\showPreview(). Definition at line 218 of file Action.php. Referenced by RevertAction\getFormFields(), RollbackAction\handleRollbackRequest(), UnwatchAction\onSubmit(), WatchAction\onSubmit(), MarkpatrolledAction\onSubmit(), RevertAction\onSubmit(), McrUndoAction\onSubmit(), RevertAction\onSuccess(), RawAction\onView(), HistoryAction\onView(), InfoAction\pageInfo(), FormlessAction\show(), EditAction\show(), PurgeAction\show(), RollbackAction\show(), and FormAction\show(). Definition at line 257 of file Action.php. Referenced by RevertAction\checkCanExecute(), HistoryAction\feed(), HistoryAction\feedEmpty(), HistoryAction\feedItem(), CreditsAction\getAuthor(), CreditsAction\getContributors(), InfoAction\getContributors(), CreditsAction\getDescription(), HistoryAction\getDescription(), getDescription(), UnwatchAction\getFormFields(), WatchAction\getFormFields(), PurgeAction\getFormFields(), RevertAction\getFormFields(), RollbackAction\getFormFields(), HistoryAction\getPageTitle(), RevertAction\getPageTitle(), InfoAction\getPageTitle(), RollbackAction\handleRollbackRequest(), MarkpatrolledAction\onSubmit(), CreditsAction\onView(), InfoAction\onView(), HistoryAction\onView(), CreditsAction\othersLink(), InfoAction\pageInfo(), PurgeAction\postText(), HistoryAction\preCacheMessages(), MarkpatrolledAction\preText(), SpecialPageAction\show(), and CreditsAction\userLink(). Definition at line 350 of file Action.php. Definition at line 340 of file Action.php. Set output headers for noindexing etc. This function will not be called through the execute() entry point, so only put UI-related stuff in here. Definition at line 359 of file Action.php. References $out, getDescription(), getOutput(), and getPageTitle(). The main action entry point. Do all output for display and send it to the context output. Do not use globals $wgOut, $wgRequest, etc, in implementations; use $this->getOutput(), etc. Definition at line 421 of file Action.php. Referenced by RevertAction\onSubmit(), EditAction\show(), DeleteAction\show(), and McrUndoAction\show(). IContextSource if specified; otherwise we'll use the Context from the Page. Definition at line 53 of file Action.php. Referenced by __construct(), factory(), getActionName(), and getContext(). The fields used to create the HTMLForm. Definition at line 60 of file Action.php. Page on which we're performing the action. Definition at line 46 of file Action.php. Referenced by __construct(), WatchAction\doUnwatch(), WatchAction\doWatch(), HistoryAction\getArticle(), InfoAction\getContributors(), CreditsAction\link(), and EditAction\show().